The Goaldiggers returned to the Turner Cup Finals in 1983-84, but their quest for 3 straight Cups ran into a buzzsaw called the Flint Generals, who swept them aside in four straight. Bill Inglis stepped down after 3 1/2 successful seasons to take the Coach/GM position in Kalamazoo. Toledo replaced Inglis with former netminder Tony Piroski. Piroski didn't last too long behind the bench, and after a 7-14-4 start, was replaced by former Diggers coach Ted Garvin. The Diggers slumped to a 32-42-5 record, their worst since 1980-81. They brought up the rear in the Eastern Division, 17 points behind Inglis' K-Wings and 31 points behind division champion Muskegon. They were just three points ahead of the worst team in the league, Indianapolis. Goal scoring dropped off in '84-85, as Toledo notched just 292 goals, second worst in the league. Ted Garvin did have a 50-goal scorer in Dave Gans. Gans notched 51 goals (third-best in the league) to go along with 105 points. Only two other players scored over 20 goals. The Diggers really struggled on the defensive side of the puck. Toledo allowed 362 goals that year, only Indianapolis allowed more. They used seven different netminders that season. Lindsay Middlebrook, a part of the 1977-78 Champions, played in 50 games that season. Dave Ross played in the next most games that year, 20. Middlebrook was the starter for the postseason. 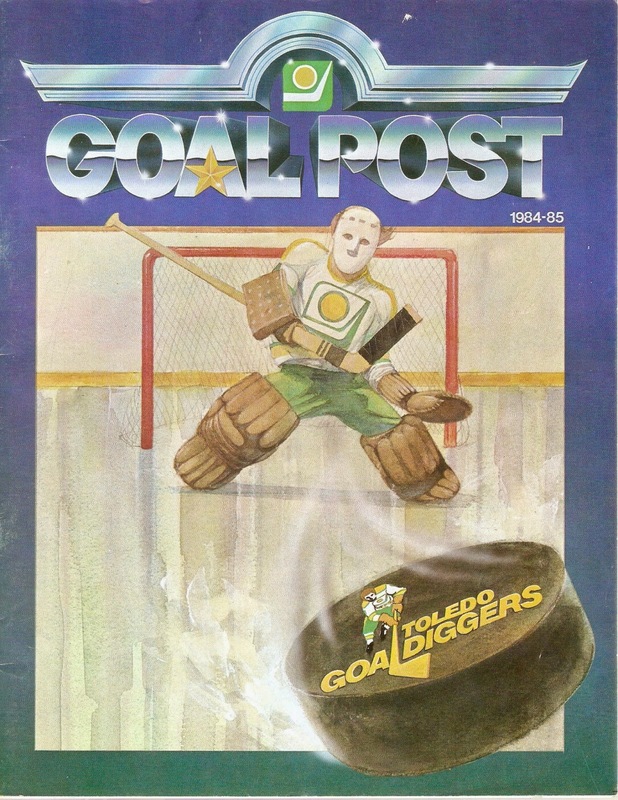 Despite finishing in the East Division basement, the Goaldiggers qualified for the postseason (only Indianapolis failed to qualify). However, their poor record meant they went against the Muskegon Lumberjacks in Round One. The Diggers stretched the Jacks to six games before falling, outscored 26-15 in the series. Muskegon would make it to the Turner Cup Finals before losing to Peoria in seven. Ted Garvin would step down after the season, replaced by Peter Mahovalich. I got this program last year on eBay. Don't see too many programs from that team online. Nice cover drawing. The program has 48 pages, all black-and-white. Local ads include Kroger, Arlington Family Restaurant and Tony Roma's ("A Place for Ribs"). That night's opponent was the rival Fort Wayne Komets. Both Komet goaltenders, Peter Sidorkiewicz and Alain Chevrier, would go on to play in the NHL. The Goaldiggers featured defenseman Don Waddell, who would later be GM of the Atlanta Thrashers. Aftermath: The loss to the Lumberjacks would be the last postseason appearance for the Goaldiggers. It was a matchup of two franchises going in opposite directions: the Lumberjacks, revived after over a decade as a bottom-feeder, versus the Goaldiggers, on the way downhill after a decade of contention. Peter Mahovalich would coach the Diggers to a 24-48-10 record, most losses in franchise history. Only the expansion Flint Spirits kept Toledo out of the basement. Mounting financial losses and declining attendance forced ownership to suspend operations after the 1985-86 season. The dormant franchise would eventually be sold to Russ and Diane Parker and relocated to Kansas City for the 1990-91 season, becoming the Kansas City Blades. Toledo would later become home to the ECHL's Storm in 1991. Currently, Toledo is home to the ECHL's Walleye.